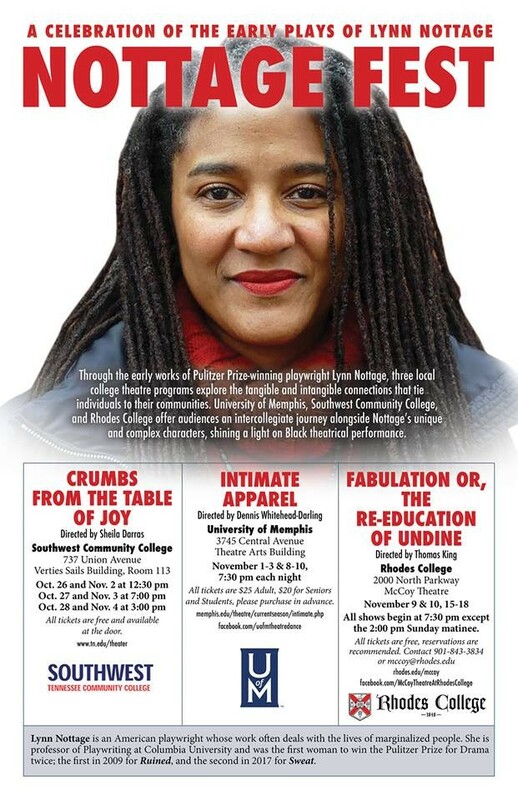 Three local college theater programs are staging work by Pulitzer Prize winning playwright Lynn Nottage. Collectively, it's called, “NottageFest." One play is being performed on each campus with an "intercollegiate finale," Sunday, November 11th, at the Dixon Gallery and Gardens. Oct. 26 and Nov. 2 at 12:30 p.m.
Oct. 27 and Nov. 3 at 7 p.m.
Oct. 28 and Nov. 4 at 3 p.m.
All tickets are free and available at the door. The play is about Undine Barnes Calles, an ambitious African-American woman in the early days of the Obama era whose best-laid plans don’t go accordingly. On the brink of social and financial ruin, Undine retreats to her childhood home and forgotten family only to discover she must cope with her cruel new reality and figure out how to transform her setbacks into small victories. Nov. 9 & 10, 15-18, 7:30 p.m. each night, except the 2 p.m. Sunday matinee.